is expected to appeal to both domestic and international LGBT markets. More brands and media have recently made great strides in promoting themselves as LGBT-friendly. They have launched products and services that target this new attractive market specifically because now the LGBT communities (lesbian, gay, bisexual, and transgender) have been growing continuously. Besides, the LGBT consumers are considered having a great taste in buying things and they usually have high purchasing power. That’s why many businesses have so much confidence in LGBT demographic groups and choose to go rainbow. 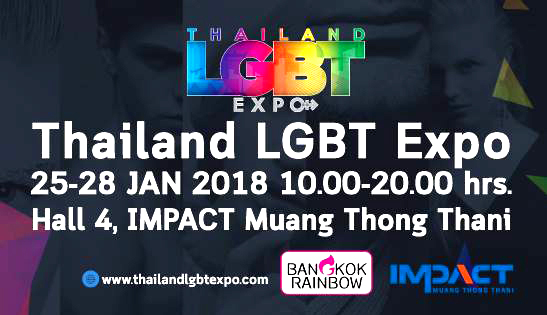 Impact Exhibition Management Co., LTD. in cooperation with Bangkok Rainbow Organization, LGBT alliances, and both local and global LGBT-friendly companies proudly present Thailand LGBT Expo 2018. Within over 5,000 square meters of exhibition area, this expo aims at promoting Thailand as the LGBT market center which offers products, services, and creative activities for the LGBT group as well as providing supportive spaces for LGBT people to express their potential. In the expo, there will be a wide range of products, services and activities catered to the unique needs of LGBT consumers (and everyone). Some interesting examples include financial and investment services, property services, fashion accessories, health and beauty products, travel packages, hotels, spas, and applications to name a few. Don’t miss “Mr. Gay World Thailand 2018”, a search for the hottest and smartest gay guy to go to the international male pageant contest, “LGBT Talent”, a competition seeking the most talented LGBT people, “LGBT Fashion Night” featuring the latest fashion trend from leading brands, “One Man One Woman”, a beauty contest searching for the winner who is good looking as a man and looks attractive as a woman, and “LGBT Art Gallery” showcasing masterpieces from LGBT artists. Along with the highlights, there will be many other interesting activities such as performances from famous artists and discussion forums to exchange ideas on the hottest topics. IMPACT Muang Thong Thani, Bangkok, Thailand.